Should You Carry a Hammock While Traveling? It can be challenging to know whether traveling with a hammock is the right decision for you. If you love hammocks and think the idea of stringing one up on every beach destination you visit sounds like paradise, then you're probably wondering about the logistics of doing so. There are many different options and, unfortunately, a lot of hammocks will take up a large amount space and weight in your backpack. You need to be certain that you will get a lot of use out of your hammock before you decide to travel with one. No Sand on the Beaches: If you head to the beach and string your hammock up between two trees, you'll often get a bit of shade from the trees while avoiding getting sand all over you. Cheaper Accommodation Options: Hostels and guesthouses will often allow you to sleep in the grounds with a hammock for a greatly reduced price -- be sure to email them in advance to check they'd be ok with it. I've met many travelers who save a lot of money by sleeping in hammocks while they travel. Be sure to test out that you can actually sleep in a hammock before you commit to doing this! Free Camping: If you're looking for an off-the-beaten track adventure on the road, then a hammock will allow you to try out free camping with ease. Maybe you're hitchhiking or camping and need to find somewhere to sleep for the night and aren't near any accommodation options. Simply string up a hammock between two trees and you're sorted for the evening. Make sure to hide away from the main road if you're planning on doing this, otherwise, you're making yourself an easy target and opening yourself up to be robbed or attacked. Hammocks are also far less bulky and heavy than camping equipment, including tents and sleeping bags. Weight: Hammocks may seem like they're quite light but when you roll them up they actually weigh quite a bit. 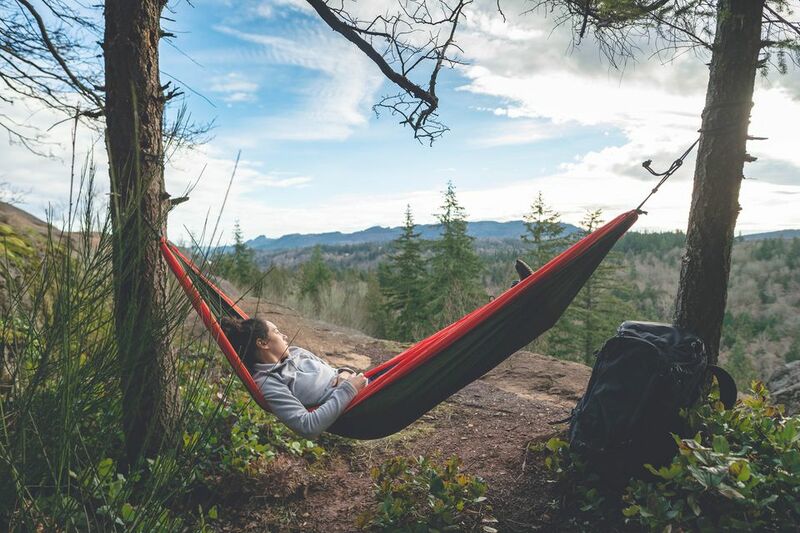 Rather than buying a hammock online, head to an outdoor specialist, such as REI, and try theirs out to see if the weight justifies carrying it. Size: Hammocks are also surprisingly large. Again, make sure you take a look at one in person before you commit to buying it. A friend traveled with a hammock for a year before realizing that he'd only used it four times during that year and it was taking up a significant amount of space in his backpack! Safety: When you sleep in a hammock you're an easy target. You're asleep and out in the open and anyone could find and rob, or attack you. In order to minimize your risk, hide your backpack in a trash bag and place it in a bush. Tie a piece of rope around it and your wrist so that you'll know if anyone tries to rob you. As a traveler, you're going to want to buy as light a hammock as possible, and preferably one that packs up small. Rope hammocks are one option, and they come in either polyester or cotton. Aim to buy one that's made of polyester if you decide to go down this route -- cotton will get mildew if you use it for camping outside for very long. If you don't want a rope hammock, then take a look at specialist camping hammocks, which are much more lightweight. They're durable and made to be used outside so won't be affected by the elements. The huge advantage to camping hammocks is that they often come with a rain cover, insect netting and pockets to keep your things in.